Hope you all had a great weekend. Sorry that my post have been so spastic lately but the holidays are quite hectic, so todays post is 90s inspired. I have been loving the re-emergence of the 90s brown makeup look. 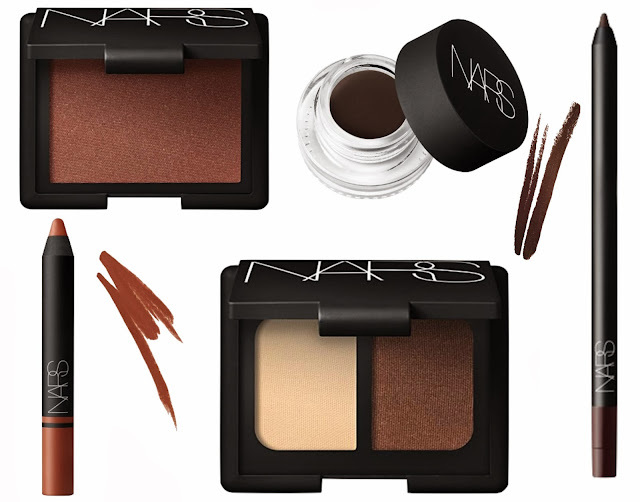 I've put together some of my favorite NARS products to re-create this look. Blush in LoveJoy, this is a shimmery bronze rose color. Eye Liner in Via De' Martelli, this is a true chocolate shade (so smooth and creamy!). Eyeshadow Duo in India song. Another truly neutral duo, this has a matte vanilla and shimmery walnut shade. Satin Lip Pencil in Het Loo, a satin or glossy finish is best when wearing a brown lip because a matte brown lip can look a but dead. What do you all think of this trend? Love it or hate it? 16 comments on "The 90s Comeback!" I love this trend! I have just been lying in wait for the day the 90's would make a comeback. Thank you and thanks for checking it out! Not too crazy about the brown lip trend personally. But I love the trend of brown shadows and liners. Love it (looking at this I do feel slightly old now though... because this look looks/feels kind of "normal" to me)! I think a trip to MAC/the Nars counter is in order! Lol, thanks for checking it out. I think many people feel the same way, they love the brown eyes and cheeks. Brown lips are definitely something work your way into.